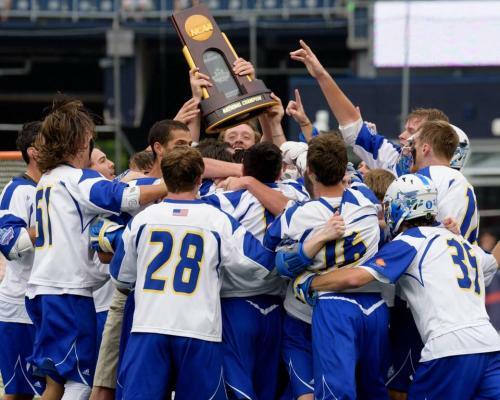 Limestone Men’s Lacrosse team celebrating after winning the 2017 DII National Championship. FOXBOROUGH, MA (courtesy limestone.edu and ncaa.com) — Looking up at a 6-4 deficit early in the second half, the nationally top-ranked Limestone College men’s lacrosse team surged ahead with a 5-0 spurt, including three goals within a 17-second span, to clinch the program’s third NCAA Division II National Championship over the last four years with an 11-9 decision over No. 4 Merrimack College on Sunday, May 28, at Gillette Stadium in Foxborough, Mass. Limestone’s defense held strong on the Warriors first possession, fending off three shot attempts before Maciejewski put the Blue and Gold on top 1-0 with a long range connection on the resulting clear. He scored on an empty net from inside the faceoff circle, but Merrimack quickly tied the game with 12:31 left. Merrimack ended the first quarter with a one-goal lead, and then doubled up the Saints, 4-2, early in the second on an extra-man score with 11:01 remaining in the half. The Warriors would extend the scoring run to 3-0 as a goal by Kyle Stenberg pushed the margin to 5-2 with 4:41 left on the clock. Limestone ended its scoring drought when sophomore Brian Huyghue (Halifax, Nova Scotia) finished off a nice feed from Maciejewski on the ensuing possession. The Saints would cut the advantage to one with 56 ticks remaining in the period as Maciejewski split the frame for the second time on the day. The Warriors delivered the opening goal in the third, pulling ahead 6-4, but the Blue and Gold rattled off three quick scores within a 17-second span to take its first lead since late in the opening quarter. Watkinson started the spurt before goals by Sheehan and Maciejewski put Limestone back on top, 7-6. The Saints continued the third-quarter surge as goals by Smith and freshman Tyler Papa (Manlius, N.Y.) pushed the string of unanswered scores to five straight. The run would prove to be the decisive blow as Limestone pulled ahead 9-6 at the end of the third – a lead it would not relinquish the rest of the way. That would be the closest things would get, however, as junior Ben Higgins (Hampstead, Md.) found the back of the net before Cornetta closed the scoring for Limestone at the 6:27-mark. Aikens surrendered one goal late, but made several tremendous saves down the stretch to preserve the 11-9 win. In the regular season matchup just over a month ago, Merrimack used a 5-0 spurt before the half to tie the game and then eventually pulled away late in the contest. The roles were reversed this time around as the Saints rode the momentum of a 5-0 surge in the third quarter, and then used two goals in the fourth to put the contest out of reach.